County Judge Rodolfo "Rudy" Gonzalez shakes the hand of a graduate of the Domestic Violence Court in County Court-at-Law No. 1 Wednesday, March 28, 2018, in Edinburg. EDINBURG — After a physical altercation with her ex-wife, a 29-year-old single mom found herself with two options: she could face up to a year in county jail or apply to take part in Domestic Violence Court. Mary, who at the time was facing a charge of assault causing bodily injury, chose the latter, and last month joined three others to become the first graduates of Hidalgo County’s newest specialty court. The Monitor is not using Mary’s real name for her protection. On a Wednesday afternoon in late March, Mary walked across a makeshift stage in County Court-at-Law No. 1 as “Pomp and Circumstance” played in the background. 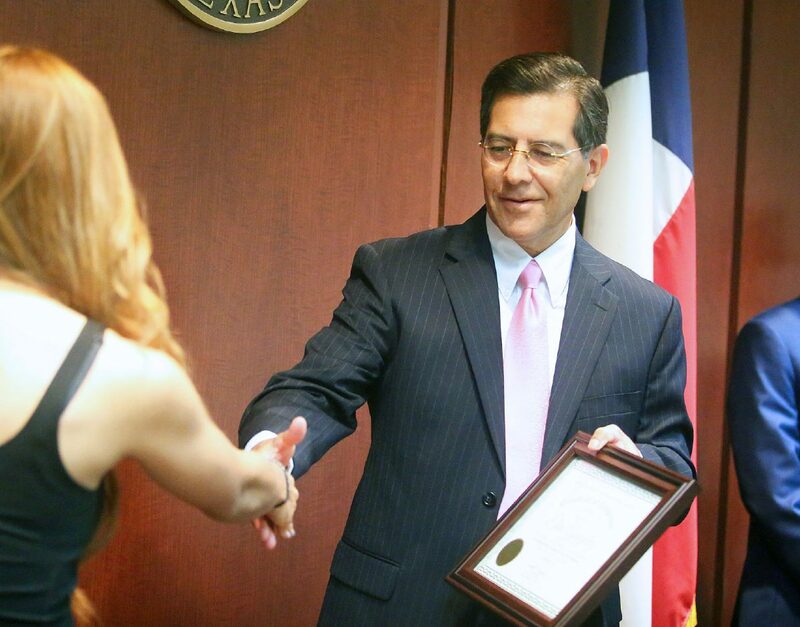 She was there to receive a plaque from County Court-at-Law Judge Rodolfo “Rudy” Gonzalez. The plaque marked a year of weekly check-ins with the court and her probation officer in addition to mandatory group and individual therapy sessions. It also guaranteed that her criminal case would be dismissed and she would not be convicted. County Court-at-Law Judge Rodolfo "Rudy" Gonzalez speaks during a graduation ceremony for participants of the Domestic Violence Court at the Hidalgo County Courthouse Wednesday, March 28, 2018, in Edinburg. More importantly, it represented a year of personal growth, a new sense of self-confidence, newfound patience and maturity, Mary said. The Domestic Violence Court is the first of its kind in South Texas, said Assistant District Attorney Carlos Benavides, the specialty prosecutor assigned to the court. It began in 2017 after Gonzalez and the Hidalgo County Community Supervision and Corrections Department applied for and received a $185,000 grant through the Texas Governor’s Office to develop a program designed to rehabilitate first-time domestic violence offenders. Participation in the program is by application only and is restricted to individuals facing their first charge of assault causing bodily injury involving a family member, a Class A misdemeanor. More specifically, said Benavides, the charge must stem from an offense involving intimate partners, such as a spouse, girlfriend or boyfriend. Therapy is a critical component of that rehabilitation and program participants receive treatment for substance abuse, anger management and underlying mental health issues, such as depression, anxiety or post-traumatic stress disorder. Participants of the program receive group therapy for six months and then individual treatment for another six months. Therapy is on a weekly basis for the first three months, a biweekly basis for the next three, and then on a monthly basis for the final half of the program. “Counseling was a lot for me … it was a lot for me to open up,” Mary said. The goal of therapy is to help participants “become aware of their thoughts, their emotions and their actions to make them more aware of their surroundings and other points of view,” said Carlos Beltrán del Angel, a licensed professional counselor intern with the probation office. Beltrán works with individual participants to identify goals that must be met upon completion of the program, and if these are not met, he will recommend additional therapy services. A common denominator between all of the court’s participants, Beltrán said, is a lack of skills to address conflict and a lack of self-awareness. Built-up resentment, frustration and feelings of invalidation can prompt someone to respond with violence, and that violence may not strictly be physical; it can include harassment or can be economic in form, such as withholding money or child support. As a requirement for acceptance into the program, Benavides first consults with the victim to ensure that he or she is comfortable with their offender participating in the specialty court. Regardless of whether a victim chooses to remain with their partner or spouse, the District Attorney’s Office and Gonzalez prioritize victims’ safety, and victims are able to report any concerns to the DA’s office or judge. “There’s never been anyone that I’ve recommended to the District Attorney to be put on this program that the victim was in opposition to,” Benavides said. Because many people choose to stay in a relationship in which they’ve suffered domestic violence, the court strives to minimize the likelihood that someone will re-offend. The specialty court also recognizes that many participants are victims themselves, either having grown up in an environment marred by domestic violence or having experienced it themselves in their own relationships. Although labeled an offender in the eyes of the court, Mary described herself as a victim of domestic violence and said she suffered physical abuse at the hands of her ex-wife. Following a violent incident, Mary said she found herself being arrested on an assault charge despite her ex suffering “no marks, no bruises” and not wanting to press charges. Mary said that she learned over this past year how to identify a violent relationship and to no longer ignore any telltale signs or indicators. “This program requires that individuals go in front of a judge on the record and admit culpability and guilt (before being placed on the program),” said Benavides. As a result, if someone is removed from the program, he or she automatically faces a conviction for the misdemeanor assault charge. 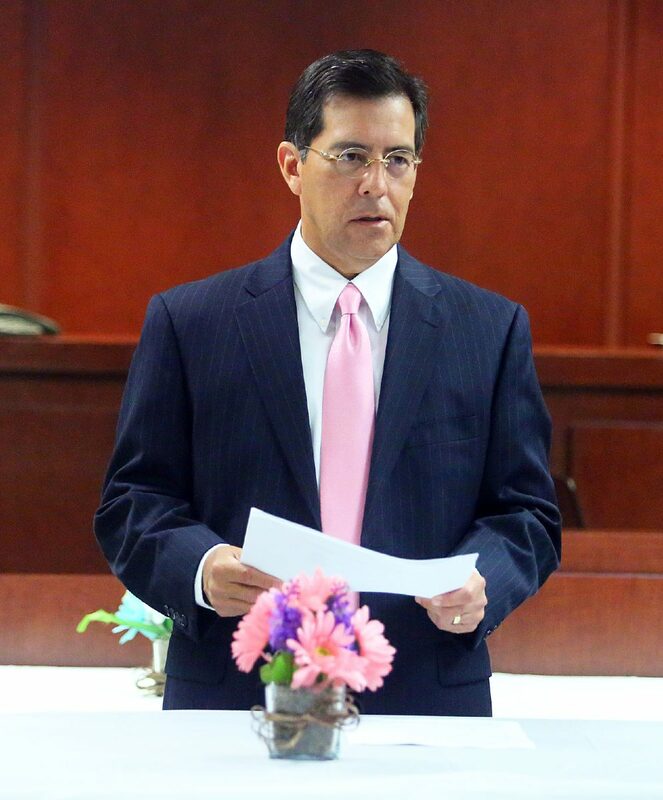 “You’re gambling that as a defendant that you’re going to comply (with the terms of the Domestic Violence Court) and not get in trouble,” Benavides said. By actively participating in the court, as opposed to conceding to conviction and being put on probation or serving time in jail, cooperation in the program “shows a maturity and a willingness to improve one’s life,” he said. There are approximately 20 participants currently enrolled in the court, with seven set to graduate in the coming weeks. Mary said she takes pride in the fact that she not only finished a program that she “didn’t like” at every moment, but that she was one of the court’s first graduates.